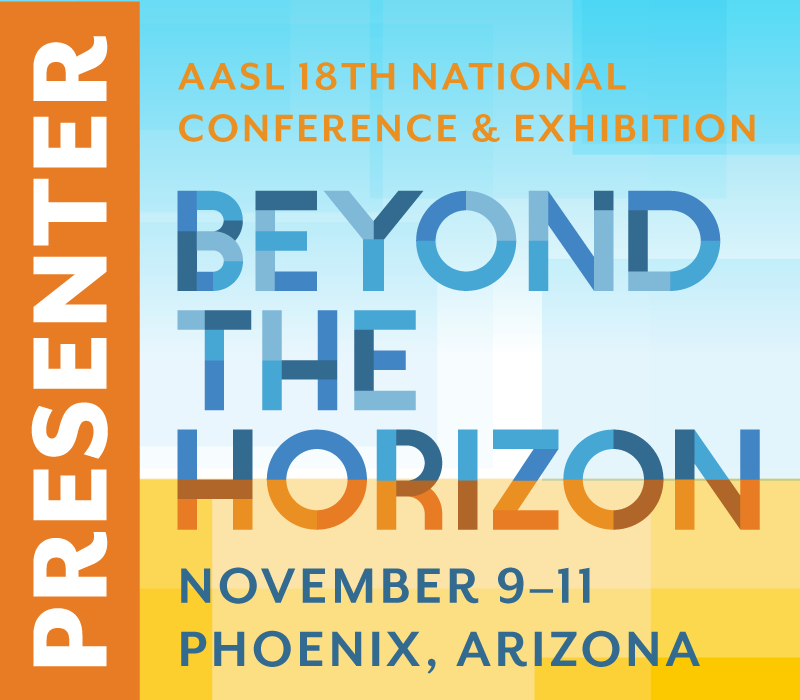 If you are an AASL member, you now have access to the concurrent sessions that were recorded at the AASL National Conference & Exhibition last month in Phoenix. In order to access this content, you will need to go to AASL’s eCOLLAB archive. 2. Click on the link titled: Brand-new eCOLLAB platform. 3. Log in with your username and password. 4. Click on: Archive Sessions. You will find the archives for seventy sessions. One of the great things is that the sessions are edited so that listeners can focus on the information presented and participate in the interactive pieces on their own time. Conference participants from Arizona were asked to volunteer to assist at as many sessions as we could fit into our schedules. I attended and volunteered at three sessions focused on the new National School Library Standards for Students, School Librarians, and School Libraries. “Inquire and Include,” “Collaborate and Curate,” and “Explore and Engage” sessions are all available on the site for your review. These are a three of the sessions I missed in Phoenix and have now been able to view. Mark Ray, Director of Innovation and Library Services, Vancouver Public Schools, and Future Ready Librarians Lead for the Alliance for Excellent Education, and Shannon McClintock Miller, Future Ready Libraries and Project Connect Spokesperson, co-presented “#futurereadylibs: Which Wedge Gives You the Edge?” on 11/10 at 11:20 a.m. (page 2 in the archives). This session is essential viewing for those who want to learn more how they can become Future Ready Librarians (FRLs) and access FRLs resources. As part of their presentation, they asked participants to compare AASL’s “Everyone Is a Learner” infographic with the Future Ready Librarians Framework . Mark and Shannon’s resources are at http://bit.ly/AASLFRL. Maria Cahill, Associate Professor, University of Kentucky, and Amanda Hurley, Library Media Specialist, Henry Clay High School, Lexington, Kentucky, presented “Survey Says: School Librarians Identifying Stakeholders’ Needs” on 11/11 at 9:30 a.m. (page 5 in the archives). Maria introduced the session with information about and an invitation to participate in the monthly School Library Connection One-Question Survey. Amanda and Maria continued the session by giving examples and promoting the idea of one-question surveys as effective and efficient ways for school librarians to gather data on which they can act to improve their library services. Judith Kaplan, from the University of Vermont and former coblogger on this site, and Deborah Ehler-Hansen, School Librarian, Fair Haven Union High School in Vermont, presented “Transform Teaching and Learning with Technology and Competency-based Standards?” on 11/11 at 3:10 p.m.(page 7 in the archives). In their interactive presentation, Judith and Deborah made connections between empowered technology tool use with personalized learning, blended learning, open access resources, Future Ready Librarians, ESSA, and more. Their resources are available at: https://goo.gl/zYoRa5 You can also search their hashtag #PDforlib. If you missed my session, “Investing in Social Capital Counts,” you will find it on page seven in the archives and on a pbworks wiki. Not all of the sessions were recorded. I regret that I was unable to hear the research papers panel I missed on November 10th. Assistant Karen Reed from Middle Tennessee State University was part of a panel that presented research papers: “‘Computational Thinking,’ ‘Information Seeking in School Library Makerspaces,’ and ‘School Librarians as Co-Teacher of Literacy’: Research Papers from the Field of School Librarianship.” She contributed the third paper. Access to these seventy sessions can be an enticement for our colleagues who are not yet AASL members. 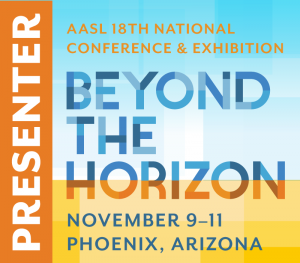 The opportunity to view these resources and develop an understanding of the importance of participation in our national association and conference can be an invitation to join AASL. Please “Share the Wealth” of AASL membership with your colleagues and your name will be entered into a drawing for a chance to win registration, airfare, and hotel accommodations for the next AASL national conference taking place in Louisville, Kentucky, in November 2019. Thank you to AASL for making these resources available to all AASL members. I look forward to reviewing more of the sessions I missed in the coming weeks. I encourage you to take full advantage of this opportunity to learn with and from our colleagues. This entry was posted in AASL, Professional Development and tagged professional development, school library leadership by Judi Moreillon. Bookmark the permalink.